Acoustics play a crucial role in air-conditioning applications, because people are stressed by loud or persistent noise. But for process applications in production buildings too, workplaces have to comply with sound limit values as defined in occupational safety guidelines. Knowing the emitted acoustic power level of flow technology components, and their interaction with the installation situation, is therefore of central importance. 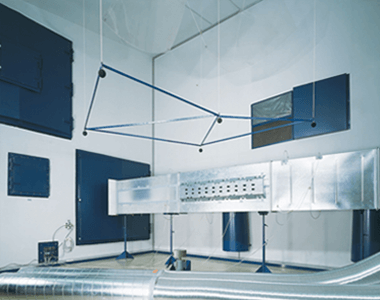 Measurement of the acoustic power level LwA of the volumetric flow or pressure is therefore in many cases the basis for optimisation of an air-conditioning or process air system. In other cases it is also used for testing of a product development. As part of LTG’s engineering services, we conduct in our echo chamber measurements conforming to accuracy class I as per DIN 45635 /2 and supplying meaningful results. The excellent infrastructure comprises various orifice and nozzle measuring sections, permitting measurement of a wide range of volumetric air flows. For acoustic measurements, we have six independent and variously positioned microphones. Their averaged measurements achieve standard divergences above the limit frequency of the room and at 110 Hz considerably below the DIN limit values. Exact measured data recording also enables us to measure octave and third-octave spectra with a two-channel real-time frequency analyser, to make assessments of the acoustic power levels (e.g. A-weighting), to calculate total acoustic power levels and to make idle level corrections. We are therefore excellently equipped for measuring real volumetric flows and checking the acoustic power levels of individual products or planned product combinations – for example of an shut-off damper plus constant volumetric flow controller plus corridor wall outlet – to verify planning or to identify weak points. Furthermore, valid measurement results also secure the (further) development of your product. Put us to the test – we look forward to receiving your inquiry!